Editor’s Note: We updated this article for 2019. This is our third time ranking the most diverse places in Minnesota. There are parts of Minnesota where there’s a high level of diversity — where people of all walks of life come together. We decided to shine a light on those places today. Using a standard measure of diversity, we ranked all 146 cities in Minnesota from most to least diverse. So what city is the most diverse in Minnesota? According to the most Census data, Brooklyn Center took the number one over all spot for diversity in Minnesota. Read on below to see how we crunched the numbers and how your town ranked. To see where Minnesota ranked as a state, we have a ranking of the most diverse states in Ameria. We still believe in the accuracy of data — especially from the census. So that’s where we went to get the breakdown of race across Minnesota. We limited our analysis to non-CDPs with a population greater than 5,000 people. That left us with 146 cities. We then calculated the HHI for each city by finding the racial breakdown of a city in percent terms, squaring them, and then adding the squares together. This left us with scores ranging from 2,832 (Brooklyn Center) to 9,595 (Byron). Finally, we ranked each city based on the HHI with a lower score being more diverse than a high score. 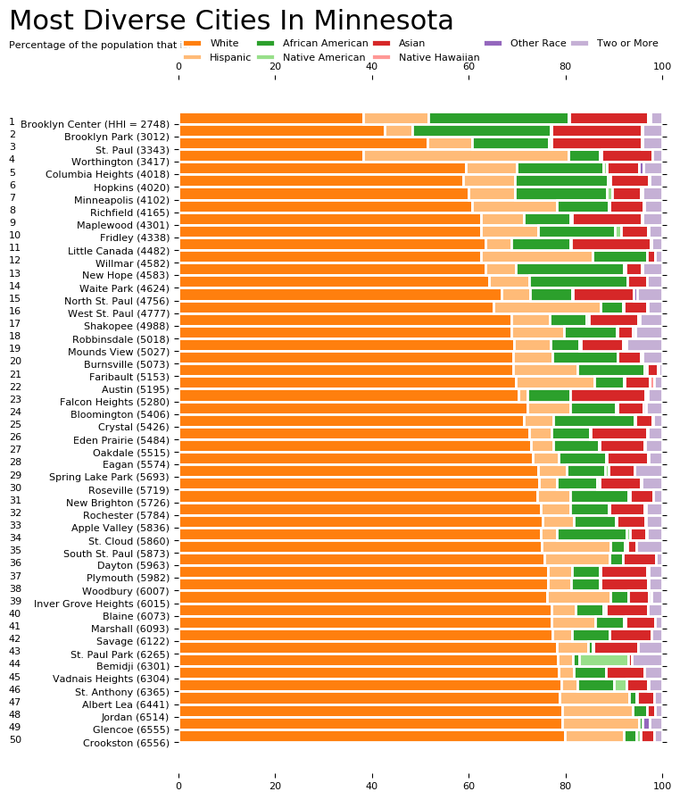 Brooklyn Center took the distinction of being the most diverse, while Byron was the least diverse city. Read on for more information on how the cities in Minnesota ranked for diversity or, for a more general take on diversity in america, head over to our ranking of the most diverse cities in America. Brooklyn Park is the sixth largest city in the U.S. state of Minnesota. The city is located on the west bank of the Mississippi River, upstream from downtown Minneapolis in northern Hennepin County. Brooklyn Park is a northwest suburb of the Twin Cities metropolitan area of Minneapolis-Saint Paul. 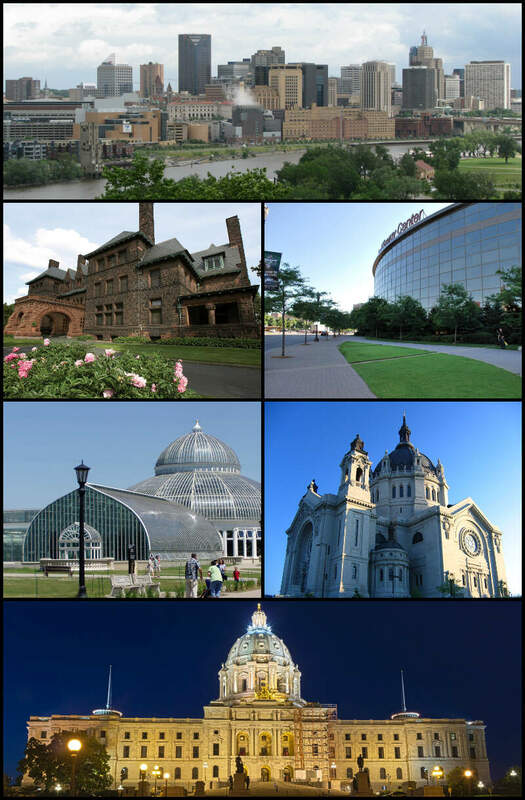 Saint Paul is the capital and second-most populous city of the U.S. state of Minnesota. As of 2016, the city’s estimated population was 304,442. Saint Paul is the county seat of Ramsey County, the smallest and most densely populated county in Minnesota. The city lies mostly on the east bank of the Mississippi River in the area surrounding its point of confluence with the Minnesota River, and adjoins Minneapolis, the state’s largest city. Known as the “Twin Cities”, the two form the core of Minneapolis-Saint Paul, the 16th-largest metropolitan area in the United States, with about 3.52 million residents. Worthington is a city and county seat of Nobles County, Minnesota, United States. The population was 12,764 at the 2010 census. 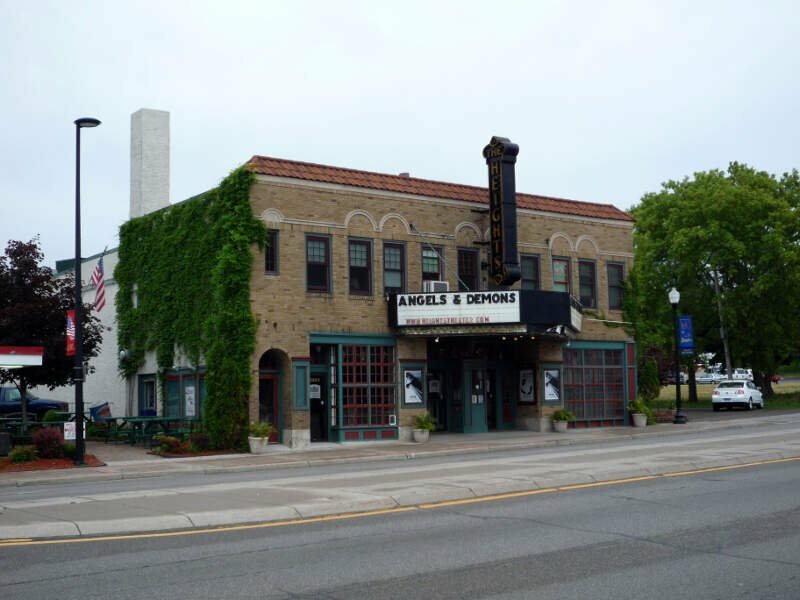 Hopkins is a suburban city in Hennepin County, Minnesota, United States, located west of Minneapolis. 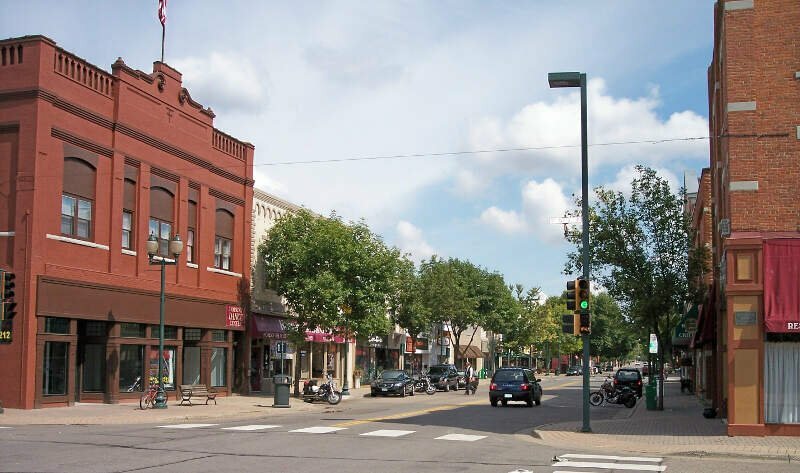 The city is four square miles in size and is surrounded by the larger, west suburban communities of Minnetonka, Saint Louis Park, and Edina. Hopkins is about 98% developed with little remaining vacant land. The population was 17,591 at the 2010 census. Minneapolis ) is the county seat of Hennepin County, and the larger of the Twin Cities, the 16th-largest metropolitan area in the United States. As of 2016, Minneapolis is the largest city in the state of Minnesota and 46th-largest in the United States, with an estimated population of 413,651. 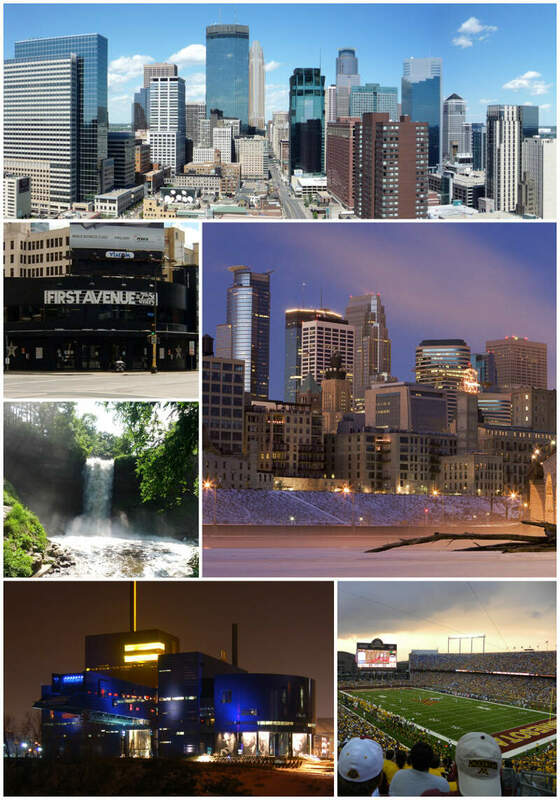 The Twin Cities metropolitan area consists of Minneapolis, its neighbor Saint Paul, and suburbs which together contain about 3.5 million people, the second-largest economic center in the Midwest, after Chicago. Columbia Heights is a city in Anoka County, Minnesota, United States. The population was 19,496 at the 2010 census. Richfield is a city in Hennepin County, Minnesota, United States. An inner-ring suburb of the Minneapolis-Saint Paul region, it is bordered by Minneapolis to the north, Minneapolis-Saint Paul International Airport to the east, Bloomington to the south, and Edina to the west. 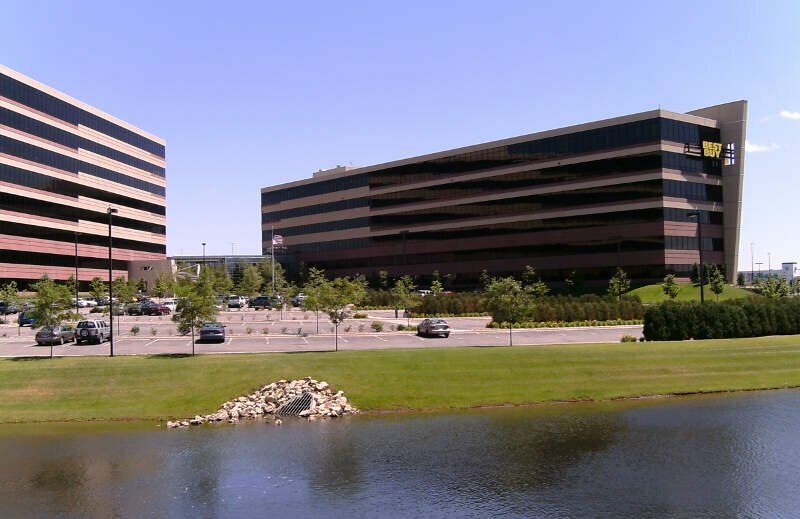 Best Buy, the U.S.’s largest electronics retailer, has its headquarters in Richfield. The population was 35,228 at the 2010 census. Fridley is a city in Anoka County, Minnesota, United States. The population was 27,208 at the 2010 census. 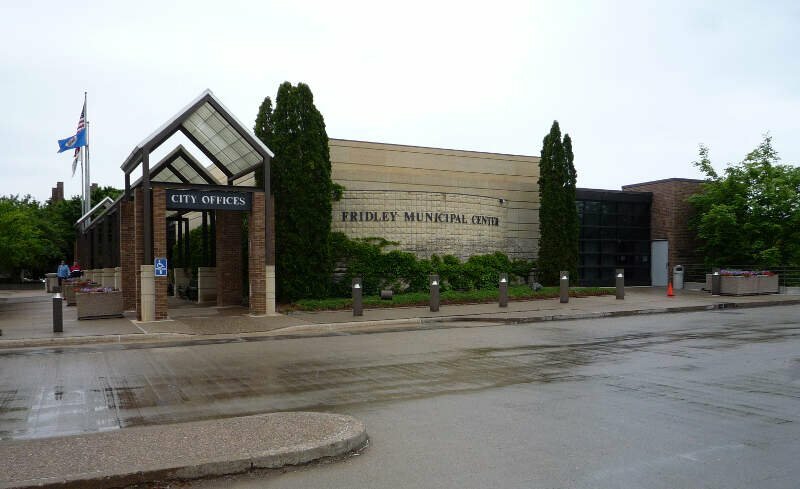 Fridley was incorporated in 1949 as a village and became a city in 1957. 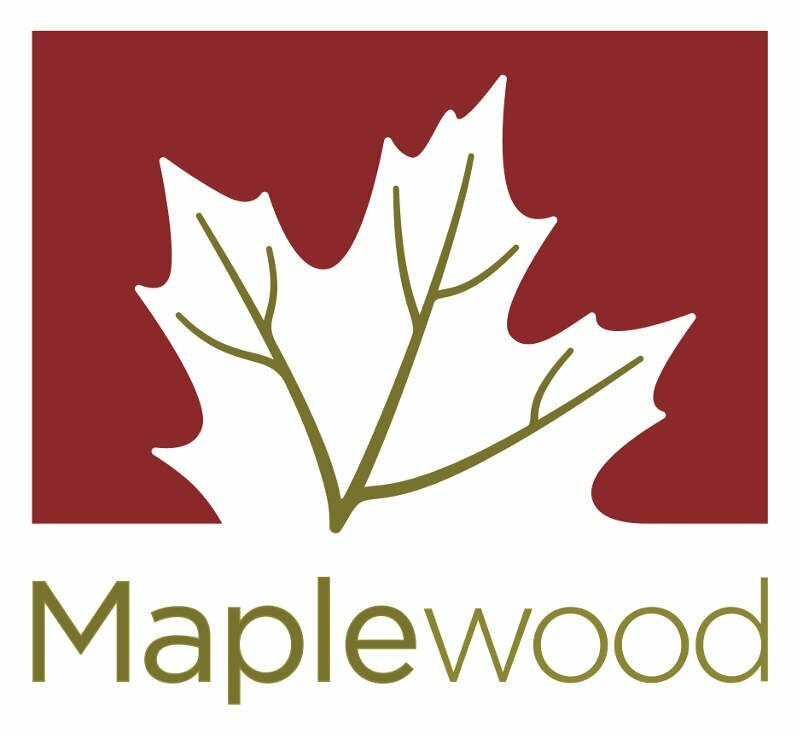 It is part of the Twin Cities Metropolitan Area. Fridley is a “first ring” or “inner ring” suburb in the northern part of the Twin Cities. 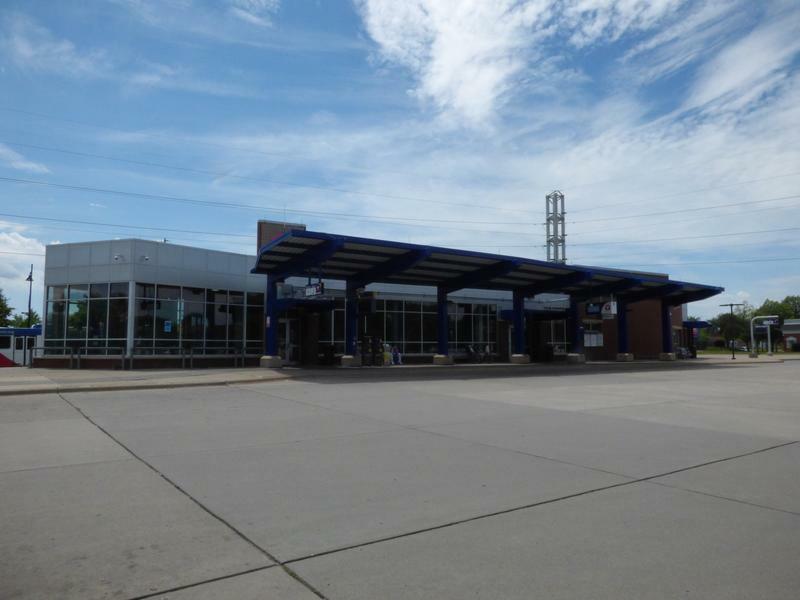 Fridley connects with the city of Minneapolis at its southern border. Neighboring first ring suburbs are Columbia Heights to the South and Brooklyn Center to the West across the Mississippi river. If you’re looking for a scientific breakdown of diversity across Minnesota, this is an accurate list.